Until publication of Riches, Classes, and Power, Alexis de Tocquerville's vision of the United States as a generally egalitarian nation predominated. While historians might quarrel about the social sources of egalitarianism, they did not dispute the soundness of the basic model; and Tocqueville's vision clearly dominated American's sense of itself as well. A self-acknowledged congenital skeptic, Pessen decided to find out whether the facts of American life sustained Tocqueville's conclusions. 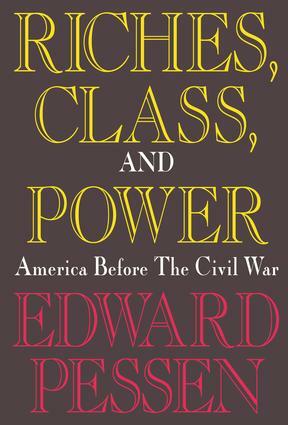 Riches, Class, and Power, represents more than five years' intensive research on the wealth, family backgrounds, careers, marriages, residential patterns, uses of leisure, life-styles, social standing, and influence and power of the wealthy in four of the five largest cities in the United States before the Civil War. Pessen examines New York City, Philadelphia, Boston and the then-separate city of Brooklyn in the 1820s and 1840s. His claim is that the massive evidence on urban life of the time sharply refutes Tocqueville's thesis. A National Book Award finalist for history, Riches, Class, and Power undoubtedly helped reshape America before the Civil War. In his reintroduction to this paperback edition, Pessen reviews the critical reaction, and reconsiders the extent to which its findings are applicable to the social structure of small or frontier towns of the period. He discusses whether unequal distribution of wealth in America results more from changes in historical circumstance or to shifts in demographic or age structure. Were There Truly Rich Americans in the "Era of the Common Man"? The Distribution of Wealth in the "Age of Egalitarianism"
Were Rich Americans in the "Era of the Common Man" Self-Made Men? Did Fortunes Rise and Fall Mercurially During the "Age of Fluidity"? Who Governed the Nation's Cities in the "Era of the Common Man"?